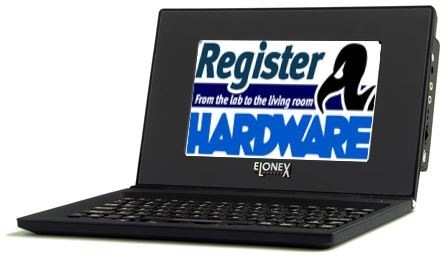 UK PC maker Elonex will next week launch an offensive against Asus' elfin Eee PC by offering a compact Linux laptop for just £99 ($193/€132). That's less than half the price of a 4GB Eee PC - if you can lay your hands on one. Asus' machine is still tricky to obtain, stock watching websites reveal. Called the One, the notebook is aimed has been developed for schools. Like the Eee, it has Wi-Fi connectivity, Ethernet networking, a solid-state hard drive, at least two USB ports, audio jacks and will weigh less than 1kg. Elonex will launch the One at The Education Show in Birmingham on 28 February. Unfortunately, it's keeping mum on the machine's full spec until then. The company did release a piccy of the PC, and it's clearly not as attractively designed as the Eee. But then you can't expect too much from a machine costing less than a ton. And if the screen half of the clamshell casing looks a little bulky, bear in mind this is a "hard-wearing case" - as Elonex puts it - designed to withstand the rigours of the classroom. The keyboard can be detached from the screen section, which also incorporates the laptop's main components.